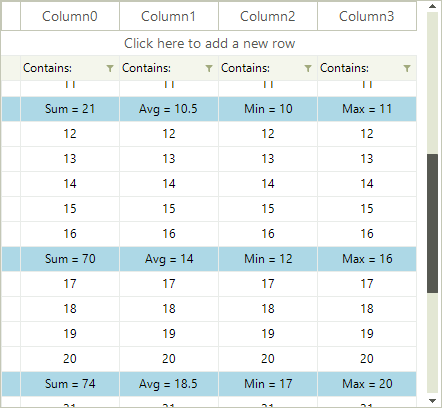 The purpose of this article is to demonstrate a sample approach how you can implement a scenario in which RadVirtualGrid displays summary rows. We will use a sample DataTable to populate the RadVirtualGrid with data by using the CellValueNeeded event. In a List of integer values, we will store the row indices at which the summary rows will be placed. Thus, in the CellValueNeeded event for the specific row index that is related to a summary row, we will calculate the summary value. The CellFormatting event will be used to apply different style for the summary cells. Finally, subscribe to the CellValuePushed event where you should modify the DataTable value for the associated cell. In order to update the summary values, call the RadVirtualGrid.TableElement.SynchronizeRows method.